Millennium development goals and the recently UN established Sustainable Development Goals encapsulate this thinking, but according to Paul Collier this notion is no longer relevant. Most of the five billion, about 80 percent, live in countries that are indeed developing, often at amazing speed. The real challenge of development is that there is a group of countries at the bottom that are falling behind, and often falling apart. 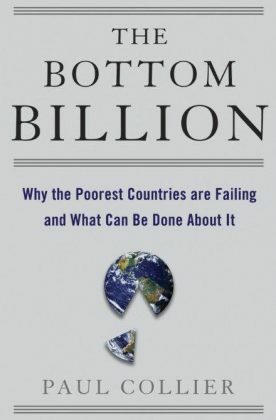 In the bottom billion, the author sees 1billion people who are diverging from the rest of the mankind. Seventy percent of this group lives in sub-Saharan Africa while the rest live in different continents and countries, namely Haiti, Bolivia, the Central Asian countries, Laos, Cambodia, Yemen, Burma, and North Korea. Collier argues that these countries are not only failing but falling apart, why? Paul convincingly explains that they have stuck in one or more, of four traps. The conflict trap, the trap of being landlocked with bad neighbors, the natural resource curse trap and the bad governance and economic policies. Seventy-three percent of the bottom billion people have been through civil war, twenty nine percent of them are in countries dominated by the politics of natural resource revenues, thirty percent are landlocked, resource-scarce, and in a bad neighborhood, and seventy six percent have been through a prolonged period of bad governance and poor economic policies. Because of these traps, the bottom billion people’s income is very low, even less than that of most rich-world cities, their average life expectancy is 50 years compared to the 65 years for the other developing countries and the per capita income grew 0.5 percent compared to the 4.5% of the developing countries. What Needs to Happen? Collier proposes a range of interventions; aid is one of them. Collier argues that trade is not going to help the post-conflict situations therefore we should forget about trade in the context of the post conflict societies. For example, Afghanistan is not going to export anything soon, therefore aid phased over a decade rather than dumped in a rush is the right instrument. But in the resource rich low income countries aid is another trap. The second recommendation is military intervention and their presence for a long time. He compared the cost of the military intervention and the cost of the civil war and realized that cost of civil war is greater than the cost of the military intervention. He also proposed laws, charters and favored trade policies. The laws and the charters will protect the resource exploitation and the money fleeing to the European and American banks, they are not only preventing the fiscal fraud, they are also demanding the imposition of the checks and balances between the governments departments. About the Author: Sir Paul Collier, born 23 April 1949 is Professor of Economics at oxford. From 1998–2003 he was Director of the Research Development Department of the World Bank. He is currently a Director of the International Growth Centre.